".. the next chapter of the Greater Depression has every chance of radically, and at least semi-permanently, overturning the basic character of American life. Ice turned to water—suddenly and unexpectedly—in Russia in 1918, Germany in 1933, China in 1949, Vietnam in 1954, Cambodia in 1975, and Rwanda in 1995. Those are just the first examples that come to mind. There are scores more. The economic events I’ve outlined are going to mean serious hardship and unpleasantness for many people. But that doesn't concern me nearly as much as the social and political reaction .. Political and social change always follow economic and financial upheaval, but I think it’s going to be much more drastic this time because the U.S. has been on the road to becoming a police state for quite a while. The trend was supercharged by the so-called War on Terror, starting in 2001. And it’s likely to go into hyperdrive in the months to come as the economy emerges from the eye of the storm. I know it seems asynchronous to think of a police state in a suburban country dotted with shopping malls. But not really .. Actually, we’re seeing it right now, or at least a preview. I expect what we’re looking at is going to be much more serious than any past crisis, partly because America has already evaporated, like the morning haze on a hot summer's day. You're not in Kansas anymore. 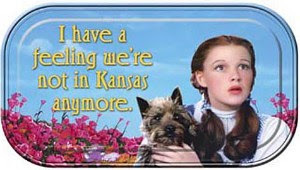 Kansas isn't in Kansas anymore." The Mint said its latest move follows a decision by the Financial Conduct Authority (FCA) in 2014 to add physical gold bullion to its list of standard assets. Director of bullion at the Royal Mint, Chris Howard, said: "The Royal Mint benefits from a centuries-old reputation as a trusted bullion provider and manufacturer of coins on a global scale. "The move to make Royal Mint gold bullion available for holding within pension schemes opens us up to a whole new marketplace." "In Wall Street, the man is nothing; the money, everything." One of the several ways HFT hurts stock investors is front running. Yet regulators are in vociferous denial. "Incredibly, ticket bots are already illegal under New York law and their use is subject to civil penalties (the attorney general recently announced that large fines were leveled against six brokers). But the markup on resale tickets is so lucrative, earning brokers millions of dollars per year, that they happily risk prosecution and treat civil penalties as the cost of business."